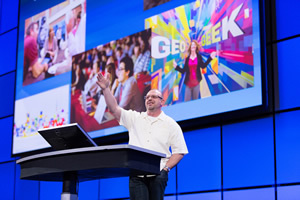 "We've got something for all of you," Esri's Jim McKinney told the 1,800 people who attended the Esri Developer Summit. What was the big technology buzz at the 2015 Esri Developer Summit (DevSummit)? Esri's development team came up with this list of top takeaways, just in case you missed this year's event. As Esri ArcGIS program manager Jim McKinney said at the Plenary Session, "Whether you are developing for the web or native apps or desktop or enterprise GIS, we've got something for all of you." ArcGIS Pro is a 64-bit application that comes with ArcGIS 10.3 for Desktop and can be installed and run on the same machine. 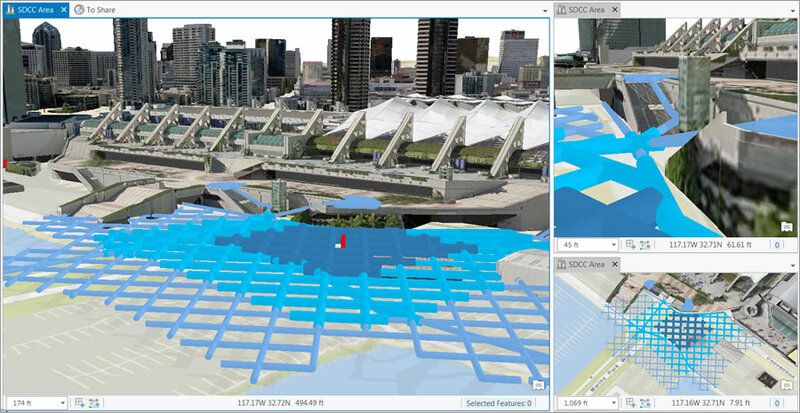 It has tools to visualize, analyze, compile, and share your data in both 2D and 3D environments and works with ArcGIS for Desktop. You can now extend ArcGIS Pro with ArcGIS Pro SDK for the Microsoft .NET Framework. This software developer kit (SDK) is based on the add-in extensibility pattern that does not require elevated user permissions or COM-style category registration. With the SDK, you can leverage modern .NET features and patterns such as Task Asynchronous Programming (TAP), Language-Integrated Query (LINQ), Windows Presentation Foundation (WPF) data binding, and Model View ViewModel (MVVM) to write integrated 2D/3D add-ins using ArcGIS Pro's editing, mapping, geoprocessing, layout, geodatabase, and geometry APIs. ArcGIS Pro SDK for .NET resources include concepts, guides, tutorials, samples, and snippets that will be available on GitHub when ArcGIS Pro 1.1 in June. Analytical networks can be used to calculate the 100-, 200-, and 300-foot fire hydrant reach for 3D environments such as staircases. 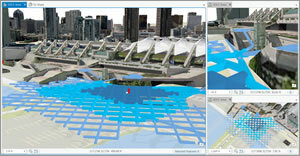 Esri is continually adding 3D to the platform. 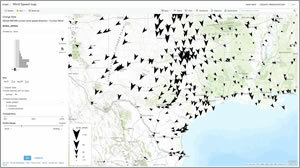 The audience was shown examples of what users are doing today with the ArcGIS Online Web Scene Viewer and ArcGIS Pro 1.0. Nathan Shephard demonstrated how 3D was being used on the desktop for analytics. Yann Cabon showed customization that will be possible on the web, and Adrien Meriaux demonstrated 3D on devices. You can use ArcGIS Runtime SDKs to add full GIS capabilities to your native apps on whatever platform you need and in your development language of choice. In 2015, new and improved APIs are being added to ArcGIS Runtime for working with the ArcGIS platform's geo information model, specifically working with portals, maps, and layers. 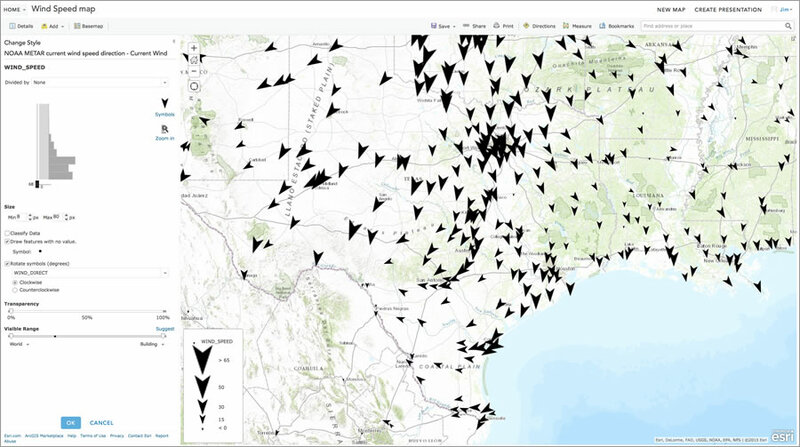 The next major release of ArcGIS Runtime, a project named Quartz, will be available in beta in June and fully released by the end of the year. Quartz will give you the ability to author and edit maps in apps and share them with your organization. You will also be able to more easily authenticate with portals and easily retrieve the content and items you are looking for. ArcGIS Runtime is also providing a number of options for cross-platform development using QML, Xamarin, Java Qt and QML to allow you to get your apps to market faster. The announcement that Esri would start to support creating and displaying maps in the vector tile format elicited cheers at the Esri Developer Summit. Esri's Marc-Olivier Briat demonstrated vector tile mapping, which offers fast, high-quality display of content and reduced cache sizes. The use of vector graphics gives you excellent quality displays on high-resolution devices. Since drawing is done on the client, vector tile maps can also be restyled for different appearances for your mapping applications. Esri's Yaron Fine offered a first glimpse of fast vector tile display running on an Android device. You can use Mobile Map Packages to easily package maps, layers, and their data to use in applications developed with an ArcGIS Runtime SDK. They are created in ArcGIS Pro and store compressed data for operational and basemap layers, network datasets, and locators. Packages can be shared on ArcGIS Online or side loaded onto devices. Once on your device, you can use the packages offline to identify, query, perform analysis, route, and geocode. Watch the video. Your maps will stand out and your data will tell a better story when you use the new smart mapping capability in ArcGIS Online. Esri's Smart Mapping helps you tell better stories with your data. It re-envisions mapping through data-driven workflows, intelligent defaults, coordinated styling, automated scale ranges, and improved color ramps. Esri has added new kinds of maps to ArcGIS Online, such as heat maps, and improved symbology with continuous color ramps, proportional symbols, improved categorical mapping, and new ways to use transparency effects to show additional details about your data. Smart Mapping, delivered via a streamlined and updated user interface, helps experts and novices alike to work faster and with more confidence and less effort. Watch the video. You can build fully functional, cross-platform native apps with AppStudio for ArcGIS, currently in beta. Watch the DevSummit Plenary Session presentation to see what the excitement is all about and try out the sample app built by Esri. The tech session on AppStudio for ArcGIS was standing-room only, and there was nonstop activity at the Showcase Island, where people learned how to submit maps created using ArcGIS to Google Play and the Apple App Store and how to go completely offline with apps. Esri is continuing its commitment to support Python and the scientific community by adding a number of Python libraries including netCDF4 for using multidimensional data, SciPy to perform scientific computation, and pandas for easier data analysis. Listen to Bill Moreland from Esri talk about this commitment to Python and explain how Esri plans on making it easier for Python users to find and use compatible Python libraries within ArcGIS by using Conda, an industry-standard build and distribution framework. This will ensure that Esri's libraries and the standard scientific libraries are always compatible. ArcPy in ArcGIS Pro is a Python site package that provides a useful and productive way to perform geographic data analysis, data conversion and management, and map automation with Python. ArcPy provides access to geoprocessing tools as well as additional functions, classes, and modules that allow you to create simple or complex workflows quickly and easily. ArcGIS applications and scripts written using ArcPy can access and work with the numerous Python modules developed by GIS professionals and programmers from many different disciplines. Watch the video. With ArcGIS 10.3.1 for Desktop and ArcGIS Pro 1.1 (both currently scheduled for release during the second quarter of 2015), you will be able to run your native R scripts directly as script tools and allow R to access ArcGIS data. Using the geoprocessing framework, your R script will work directly with Esri-supported feature data, honoring its selection and projection. With R and its thousands of contributed libraries added to an already awesome platform for scientific computing and visualization, ArcGIS continues to deliver on its promise to become the platform for the scientific community. Watch Mark Janikas demonstrate how to use your R script from within ArcGIS.